We are sure you’ll agree that there are some items which are far too precious for you to simply keep in a locked drawer. This is, of course, why you are looking for a safe to keep all of those important documents, jewelry, and other items in. By now, though, you may have realized that this is not as simple as you might have imagined. While there are plenty of models to choose from, how can you tell which one is superior? After all, you need a safe that has a complex security system, is able to protect your valuables under lots of conditions, and can stand the test of time. There really is no telling what you might want to put in your safe. You may just want to store documents or, on the other hand, store something bulkier like an ornament. Fortunately, the Stack-On safe has three adjustable shelves. So, you can arrange them according to the items that you are planning on keeping in the safe. This is also a rather secure locker as it actually has up to ten different locking points. There are 1.5inch live action bolts and a four-way locking system. The electronic has also been safeguarded from drilling or any sort of tampering. It has a metal plate behind the lock that makes it difficult to drill through. There are also lights to indicate just which mode the safe is in and you will also be warned of a low battery by the light. While the door is actually quite thick and sturdy, the side and back walls are a bit thinner. Theoretically, there could be weak points on the safe. Now, at a little over 200lbs, this isn’t necessarily the heaviest safe around. Not to worry, though as you can bolt it to the floor to prevent anyone from walking away with it. You will be relieved to know that this safe will be able to protect your belongings even in the event of a fire. It has proven to be fire resistant for up to 30 minutes in temperatures of up to 1400˚F. If you are looking for a low maintenance safe then this is the one for you. Unlike many of the other safes on the market these days, this one is equipped with a combination lock. This way, you don’t have to worry about the batteries dying and the safe locking out. Of course, this means that the code is set and that you need a locksmith to change it. Also, if you aren’t too familiar with combination locks it could prove to be a bit tricky to deal with. Speaking of locks, there are three heavy duty locking bolts and deadbolts as well. To top it off, there are solid steel hinges to keep the door in place. 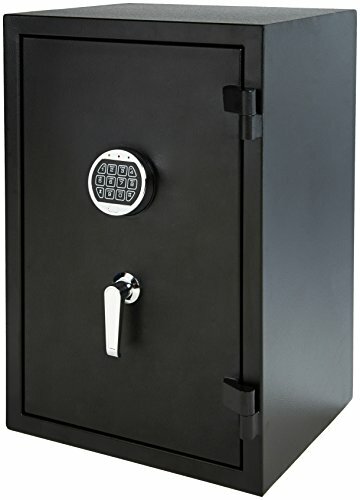 This is a great safe for documents, files, jewelry, and money. Due to the size of it, though, you will find that you will not be able to fit in larger items. However, the shelf is removable so you can make room for something a little larger if you want. This safe isn’t too heavy but fortunately, there are already four pre-drilled holes along with an anchor kit. This makes it a lot easier for you to fix the safe to the floor for added safety. You shouldn’t let its small size fool you as this is a safe that is constructed from solid steel. It has an incredibly thick door and equally strong walls to boot. The safe is so strong that it should be able to survive a two-story fall. On top of this, it is fire-resistant but only up to 380°F heat for two hours. 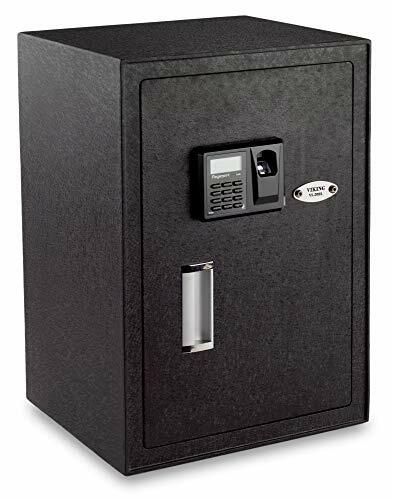 If you want a decent safe for your household where you can store important documents, jewelry, and even money, then this is a model that will work well for you. The AmazonBasics product is a good-sized safe that has adjustable shelves. This gives you a lot more freedom to store whatever you want in there. 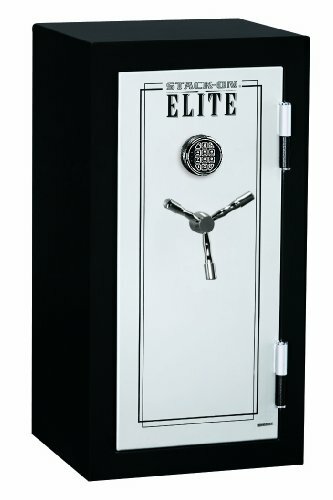 The safe relies on an electronic lock and five 0.75 inch bolts to keep all your belongings well-protected. Of course, since forgetting your password isn’t out of the question, there is a failsafe option. There is a keyhole behind electronic pad housing that can be opened with your personal key. The only real issue with the electronic keypad is the fact that it is quite flimsy. It isn’t inconceivable that someone can break through it. For added safety, this safe has also been designed to be fire-resistant up to a certain level. Ideally, it should be able to keep your things safe for up to 20 minutes in a 1200°F blaze. The safe can also be bolted to the floor so that it can’t be moved as easily. However, there is only one bolt holding it to the floor which isn’t too secure. If you are looking for something that is a bit more high tech, you will find that the VS-50BLX safe is for you. This safe relies on both an electronic keypad as well as a biometric fingerprint scanner to keep all your items secured inside the safe. The safe can store up to 32 different fingerprints so that other members of your family can access things as well. The keypad can work as an alternative for this feature. It isn’t just the keypad securing the safe though, as the door is equipped with 0.78inch bolts that keep it locked at all times. One of the perks of this safe is that it has a warning beep that alerts you if you accidentally leave the door open. The safe is made from laser cut steel that has seamless welding. Due to this, there are no gaps available to pry the door open. The shelves in this security safe are adjustable so you can arrange the interior however you choose. What’s more, there is an interior light to help you see better as well. Now, unfortunately, despite all of these high tech features, this isn’t a fireproof safe. This means that you can’t guarantee the safety of your items under all conditions. There are anchor bolts that you can use to keep the safe firmly secured to the ground, though. While some combination locks can be quite tricky to deal with, the SentrySafe is not. Once you have the hang of it, you will be able to open it easily every time. Also, thanks to the manual mechanism that is in place, you don’t have to worry about replacing batteries or maintaining the safe in any way. The combination lock is made from rather cheap plastic, however, and you will need to be careful with it so that you don’t damage it in any way. There is also no denying that this is certainly a secure safe. It comes with six live-locking bolts and a pry-resistant hinge bar. However, what really sets this safe apart is how well it can withstand various conditions. For one thing, it can survive in up to eight inches of water for about twenty-four hours. So, if you live in an area that frequently floods, you can have peace of mind. On another note, this safe can continue to protect your belongings for around 20 minutes in 1700°F. 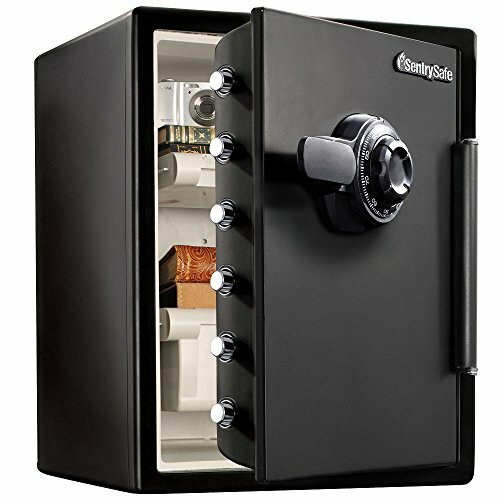 The company also has an After Fire guarantee that will help you out with the safe. Another odd thing about this safe, though, is that the interior contains shallow and deep trays to keep your things in. While this does help organization, it is also is a waste of space. There are actually two ways that you can distinguish residential safes. The first is by the way it is mounted or secured. The second is with the lock that it utilizes. In this section, we look at both types. Free Standing Safes: these are often the most common types of safes as they don’t require you to make too many structural changes to a room. They are also usually the most affordable option, particularly if you tend to move from place to place. These safes can be anchored to the ground so that they can’t be easily removed by thieves. Wall Safes: then there are wall safes. The main difference between this type and the free-standing type is that these safes are built into the wall. This largely eliminates the possibility of anyone making off with it. However, they can be pricier to install and are permanent fixtures. Floor Safes: with floor safes, a considerable hole needs to be drilled into the floor – this is where the safe will be stored. The benefit of such a positioning is that it is virtually impossible for anyone to make this safe budge. At the same time, it is a costly affair that can be quite difficult to access yourself. Combination Lock: this is something that most people have had to use at some point in their life. Now, the main perk of this type of lock is that it is reliable and will continue to work well for a longer period of time. It also doesn’t require any maintenance as you don’t have to change the batteries. However, you are often limited to the factory codes provided to you and it can be a bit time-consuming to open your safe this way. Electronic Keypad: these are becoming more commonplace these days as they are easier to use. You simply type in the code and the door swings open. These locks are often equipped with various beeps and lights to warn you if the door is not locked properly or if the code is incorrect. The downside of these locks though is that you need to remember to change the battery at the right time or they could lock you out. Biometric Lock: if you want to make opening your safe a quick and secure process, then a biometric lock is the way to go. The ones for personal use often use your fingerprints to identify you and will swing open after the scan. Now, regardless of the type of lock that you use, you should always have a failsafe option. This is often available in the form of a key that you can use to open the safe in case the other method is malfunctioning. So, apart from the locks mentioned above, what are the other factors that you should look for? The lock is just the first line of defense against thieves. It is the locking bolts that actually do all of the work. So, how can you make sure that your safe has the right ones? Well, the trick here is to look at the number of locking bolts. As a rule of thumb, the more, the better. After all, a greater number of bolts are able to withstand a brute force attack. Of course, it doesn’t really matter if the lock is top-notch if the safe isn’t made of good quality materials. You should look for models that are made from durable materials like steel. You should also look for walls and doors that are thicker as these are resistant to force. Considering that you will store nearly irreplaceable documents and items in your safe, you probably want it to be able to withstand a fire. See, there is no guarantee that your safe can come through a fire completely unscathed. This is especially true for raging, destructive fires. However, the safe in question should be fireproof for a certain period when under specific temperatures. A hard and fast rule is that a good fireproof safe should be able to protect your belongings for around 30 minutes in a 1550°F fire. This means that the safe mustn’t only not succumb to the fire, it has to keep the internal temperature of the safe at the right temperature as well. Depending on what you are storing in the safe, the internal temperature shouldn’t rise between 125°F and 350°F. Otherwise, it will destroy the contents. This may be a bit of an odd thing to consider but it is important. Now, of course, you should think of the room that the safe will be placed in. Nonetheless, it is more important to focus on the items that will be going into the safe. If you only want to store passports, documents, and papers, then you will find that a small to medium-sized safe will do. For electronics and similar items, though, you will require a medium-sized or large safe. Remember, you should never jam pack things into your safe. There should also be some space available, particularly if you are planning on adding more items in the future. Adjustable shelves: you should always look for shelves that can be adjusted or removed. This way, you will be able to ensure that you can customize the space inside the safe. Anchoring features: since you don’t want the safe to be moved, you should consider the mechanism that is in place to keep the safe firmly bolted to the floor. Items that you can store: you should be aware that not every safe can be used to store all items. For instance, there are certain things like electronics and memory cards that require specialized safes. So, you should always double check this specification before you buy a safe. So, to wrap things up, you are now aware that the main things that you should look for in a safe are a good lock, proper bolts, solid construction, and fire safety. If you are looking for a budget-friendly option, you will find that the AmazonBasics and Viking Safe are good options for you. However, if you want a safe that is going to be quite impenetrable and able to withstand any potential burglars, then the Stack-On safe is what you need. 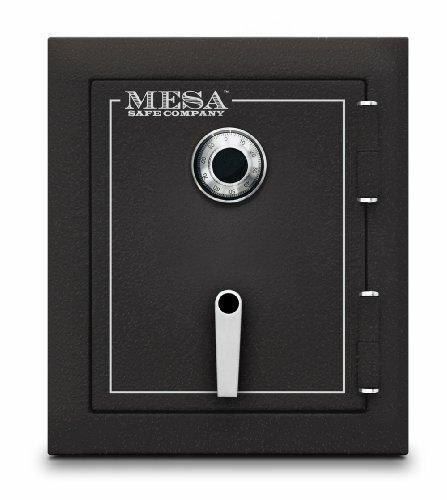 If you want an old-school safe that is still able to offer a lot of protection, then either the Mesa safe or the SentrySafe will do. This brings the discussion about the best safe for your home to an end. You now know what the right options are and even which features to look out for.